As the “humanitarian crisis” continues at the U.S. border, a Pulitzer Prize–winning journalist and activist is on the front lines, becoming part of the story himself. 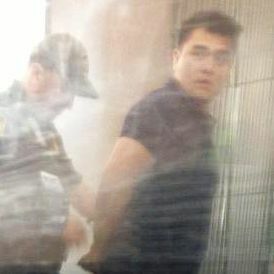 Jose Antonio Vargas, who came out as undocumented in a New York Times Magazine essay in 2011 and went on to become the most visible undocumented immigrant nationwide, has been detained by Border Patrol in McAllen, Texas, after attempting to get on a plane to Los Angeles with the only identification he has: a visa-less passport from the Philippines. When my friend Mony Ruiz-Velasco, an immigration lawyer who used to work in the area, saw on my Facebook page that I was in McAllen, she texted me: “I am so glad you are visiting the kids near the border. But how will you get through the checkpoint on your way back?” A curious question, I thought, and one I dismissed. I’ve visited the border before, in California. What checkpoint? What was she talking about? Identification aside, since outing myself in the New York Times Magazine in June 2011, and writing a cover story for TIME a year later, I’ve been the most privileged undocumented immigrant in the country. The visibility, frankly, has protected me. While hundreds of thousands of immigrants have been detained and deported in the past three years, I produced and directed a documentary film, “Documented,” which was shown in theaters and aired on CNN less than two weeks ago. I founded a media and culture campaign, Define American, to elevate how we talk about immigration and citizenship in a changing America. And I’ve been traveling non-stop for three years, visiting more than 40 states. Knowing full well what could happen when he tried to leave, groups supporting Vargas’s cause immediately sprung to action as soon as he was detained. Jose’s current situation is our reality every day. For many undocumented immigrants who live near the border, we can’t return to our home countries, and can’t travel outside of a 100-mile radius in our home state of Texas. We’re trapped inside a cage. That’s why it’s important for DACA to be expanded, so people along the border can be integrated into this country and be reunited with their families. In a few hours, the petition passed 1,000 signatures, more than double its stated goal of 500, with Vargas’s personal story once again bringing huge amounts of visibility to a much larger issue. Update: "I’ve been released by Border Patrol," said Vargas in a statement just before 5 p.m. CDT. "I want to thank everyone who stands by me and the undocumented immigrants of south Texas and across the country. Our daily lives are filled with fear in simple acts such as getting on an airplane to go home to our family. With Congress failing to act on immigration reform, and President Obama weighing his options on executive action, the critical question remains: how do we define American?"